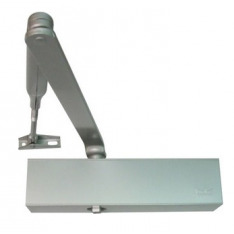 Heavy Duty Door Closers are designed for larger doors of up to 1,250mm in width. These mechanisms are vital for fire safety, access control, and can aid with noise pollution, heat loss & drafts. Our range of heavy duty door closers include an adjustable valve, which allows for the adjusting of the mechanisms closing speed, latch action, delayed closing and back check for preventing the door from slamming open. Our certified heavy-duty door closers are vital for fire safety within commercial buildings. When installed on fire doors, these mechanisms ensure the door is closed, preventing the spread of fire and smoke around the commercial building. Due to the adjustable valve, our range of heavy duty door closers can aid physical access control within commercial buildings. A key energy efficiency benefit comes from the closing and back-check mechanism, which aids in the reduction of heat lose and internal cold drafts. For smaller doors we also supply Medium Duty Closers and Light Duty Door Closers for the same strong and smooth doorway mechanism. If you’re seeking a door closing device which can be automatically held open and triggered in line with the fire alarm, please view our range of Electro Magnetic Closers and Dorgard Fire Door Retainers. Certain commercial and residential building may require a less obvious and somewhat aesthetically pleasing solution, if this is the case, please view our range of concealed door closers.